Scientists and others decry the decision, arguing that it will slow efforts to address the risks of climate change. U.S. president Donald Trump declared yesterday that the United States will withdraw from the landmark Paris climate accord to limit greenhouse gases. Trump, in a much anticipated speech in the White House Rose Garden, called the accord unfair to the United States and said that the country will immediately cease implementing the agreement. Specifically, Trump said that the United States would stop both fulfilling its individual climate plan and contributing to the Green Climate Fund to assist developing nations with climate change–related investments. Trump said he is prepared to renegotiate the agreement. “I’m willing to immediately work with Democratic leaders to either negotiate our way back into Paris, under the terms that are fair to the United States and its workers, or to negotiate a new deal that protects our country and its taxpayers,” he said. The Paris climate change agreement to limit greenhouse gases aims to hold the increase in global average temperature to well below 2°C above preindustrial levels and to pursue efforts to limit the increase to 1.5°C. It also calls for boosting climate change adaptation measures, helping poor countries to address climate-related challenges, and updating countries’ individual climate plans every 5 years. The accord entered into force in November 2016, less than 12 months after 195 nations agreed to it in 2015. The actual U.S. withdrawal from the accord is still a few years away. Under the agreement, parties wishing to leave the pact can give notice of their intent to do so only after the agreement has been in force for 3 years. Then another year must elapse after that notice is given before the withdrawal can occur. The president’s decision drew sharp rebukes from some prominent scientists. “By withdrawing from the Paris climate agreement to double down on a coal and fossil fuel energy agenda, Trump has engaged in unilateral disarmament in the economic arms race that is the transition to clean energy. Other nations, like China and the European Union, now take the lead in global leadership, moral authority, and economic competitiveness,” said Mann, professor of atmospheric science at Pennsylvania State University in University Park. Other scientists welcomed Trump’s move but said it will have little impact. “It is hard to see how Trump’s withdrawal from the Paris Accord is going to make much of a difference,” said Patrick Michaels, director of the Center for the Study of Science at the Cato Institute, a Washington, D. C., think tank dedicated to principles of limited government and free markets. “After all, the economically driven shift from coal to gas for electrical generation will continue or even accelerate,” he noted as one of the reasons not to expect much difference. She told Eos that the best outcome to the U.S. withdrawal from the accord would be “to take a fresh look at the problem,” including seeking a better understanding of natural climate variability and its interaction with human-caused climate change and a better understanding of the socioeconomic harms and benefits of a changing climate. Many environmental and business leaders and other observers said Trump’s decision harms efforts to slow down greenhouse gas emissions, U.S. climate leadership, economic benefits for the country from clean energy, and national security. 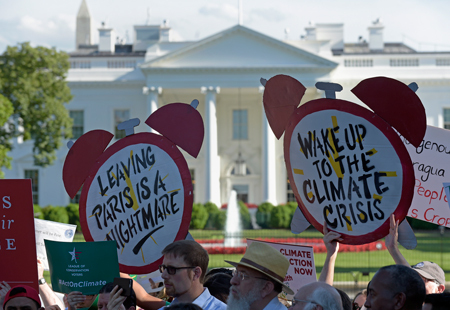 “President Trump’s decision to withdraw from the Paris climate agreement is the biggest failure of leadership in American history,” said Mark Reynolds, executive director of the Citizens’ Climate Lobby, an organization based in Coronado, Calif.
Bob Inglis, a former Republican member of Congress, said that by abandoning the pact, Trump adds a new dimension to the word “hoax” as it is used with regard to climate change. Trump himself “is choosing to become the worldwide face of climate hoaxerism,” said Inglis, who is executive director of republicEn.org, a Fairfax, Va.–based group that promotes free enterprise action on climate change. In a tweet, Todd Stern, former U.S. special envoy for climate change during the Obama administration, urged continued action on climate change. “Trump just betrayed the world. Now the world will fight back,” he tweeted. Not only does withdrawal cause harm, but it wasn’t necessary to address the concerns Trump raised about the pact, said Susan Biniaz, lead U.S. climate lawyer for the U.S. Department of State from 1989 until earlier this year. Pulling out “is against all U.S. interests—diplomatic, economic, and environmental,” she said. Editor’s Note: The American Geophysical Union, which publishes Eos.org, issued a statement yesterday about President Trump’s decision to withdraw from the Paris climate accord. Citation: Showstack, R. (2017), Trump says United States will withdraw from Paris climate accord, Eos, 98, https://doi.org/10.1029/2017EO075283. Published on 02 June 2017.